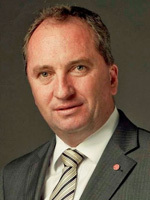 Agriculture Minister Barnaby Joyce has been a member of the Federal Parliament since 1 July 2005 when he assumed the Queensland Senate seat he won at the 2004 federal election for the Nationals. Minister Joyce is currently the Nationals Parliamentary Deputy Federal leader to Deputy Prime Minister Warren Truss. Previously, Minister Joyce was the Leader of the Nationals in the Senate for just under five years. On 8 August 2013, Minister Joyce resigned from the Senate to contest the House of Representatives seat of New England at the September 2013 federal election. The seat had been held by independent MP Tony Windsor. In winning the northern NSW regional seat, Minister Joyce became the first person in Australian politics to have represented one state in the Senate and another state in the House of Representatives. In Opposition, Minister Joyce held a number of portfolio responsibilities including being the Coalition spokesman for Finance and Debt Reduction (2009–10), for Regional Development, Infrastructure and Water (2010), and for Regional Development, Local Government and Water (2010–13). Minister Joyce was the fifth child in a farming family of six children. He was born in Tamworth and grew up at Danglemah, where his family owned a sheep and cattle property. He was educated at Woolbrook Public School and St Ignatius College, Riverview. He studied at the University of New England where he gained a Bachelor’s degree in Financial Accounting. Minister Joyce practised as an accountant, as a rural banker, and ran his own accountancy firm in St George, Queensland for 10 years. As a Senator, Minister Joyce was responsible for authoring “The Birdsville Amendment” which was designed to protect small business from predatory pricing through the Trade Practices Act. Minister Joyce was also instrumental in negotiating a multi-billion dollar regional telecommunications package as a condition of the government’s full sale of Telstra in 2005. During his time as a Nationals Senator and prior to becoming a shadow minister, Minister Joyce crossed the floor 28 times. Minister Joyce was appointed as Agriculture Minister on 18 September 2013. As well as his ministerial responsibilities, Minister Joyce was also appointed as chair of the Prime Minister’s Water Infrastructure Ministerial Working Group. Minister Joyce is married with four daughters.